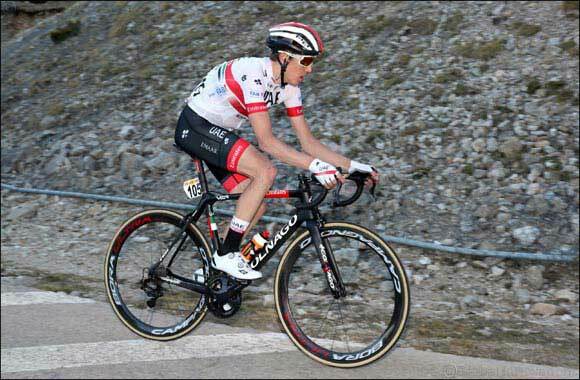 Dubai, UAE, March 28, 2019: It was double delight for UAE Team Emirates yesterday as Fernando Gaviria and Dan Martin both secured top three finishes in their respective races. Gaviria, competing in the Driedaagse Brugge-De Panne in Belgium was first up, battling hard in a sprint finish to take home second place behind eventual race winner, Dylan Groenewegen (Jumbo-Visma). It was the Colombian’s seventh podium finish for UAE Team Emirates, in what is turning out to be a fantastic debut season for the sprinter. Second up was Dan Martin. The Irishman was competing in Stage three of the Volta a Catalunya and was unfortunate not to take top spot, in what was a thrilling climb to the finish. With just 200m to go, it looked like Martin was in with a shot at the stage victory, but going round the final bend Adam Yates (Mitchelton-Scott) was able to come around Martin and take the win, with Egan Bernal (Team Sky) tight on his wheel. Martin’s third place finish in the stage allowed him to jump 14 places in the overall General Classification (GC) standings where he now sits in fourth place just 37” behind the green jersey.